First Unitarian Church is delighted to welcome Windborne! What better time to learn about and enjoy the folk tradition of protest singing? Open to the public — All are welcome. One price for both workshop and performance: $20 regular, $15 senior, $10 student. Come to either or both! Please enter through church main entrance, 5650 South Woodlawn Avenue. Can you help spread the word? Great! Please share widely: the flier, the facebook event, and Windborne’s website. For more information, please contact First U’s Music Director Jeff Hamrick (music@firstuchicago.org). 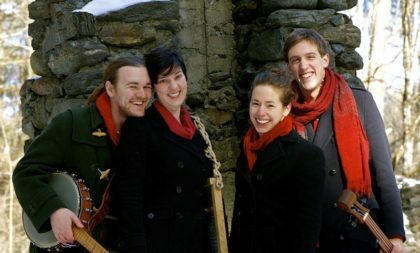 Windborne is a dynamic quartet from New England that achieved great recognition following the release of their widely shared video featuring them singing in protest outside Trump Tower in New York following the inauguration of Donald Trump. Over the past decade, Windborne has sought out masters of traditional singing styles in the U.S. and around the world to study a variety of vocal music. Through these collaborations, they have developed the vocal agility and authentic sound for which they are known. Their wide-ranging concert programs include songs from Corsica, the Republic of Georgia, Bulgaria, Quebec, and Basque country, as well as traditional and original American folk music. They believe deeply in the power of music to change hearts.